Panchgani is a picturesque hill station located in the Satara district of Maharashtra. Located at an elevation of 1293 meters above sea level, this also comprises of the second longest plateau in Asia, after the Tibetan Plateau. It is venerated for its landscapes, which comprise of five hills, with the backdrop of the mountains and spectacular view of the Western coastal plains.The earliest known documentation about Panchgani is from the 1860s, when British ruler discovered this stretch of serenity and put Superintendent John Chesson in charge of developing it into a holiday getaway for them. Panchgani is the perfect venue for lovers of nature and natural beauty. All around one can see greenery and the colors of flowers. There are many venues to go on longs walks and treks or simply to relax. Many movies have in fact been shot in Panchgani, owing to its picturesque natural beauty. There also many famous boarding schools and other educational institutions. The weather is mild but refreshing and the air is rich with oxygen, so much so that many visitors simply go to Panchgani to breathe in the unpolluted air and detoxify themselves from the evils of city life. Popular tourist spots in Panchgani include the Mahabaleshwar Temple, Mount Malcolm, Table Land, Panchganga Mandir, Wilson Point, Lingmala Falls, Bombay Point, Sydney Point, Venna Lake and Dhom Dam. Panchgani, like most hill stations, has mild weather all year round. There are hills on all sides of it and the Krishna River flowing nearby. The temperature ranges from a maximum of 34 degrees Celsius in summers to a minimum of 12 degrees. Celsius in winters, with very low humidity. Monsoons hit this area hard during the months of June to September. The hot and dry summers last from March to May, while the mild winters last from November to February. The best time to visit Panchgani is during autumn, winter and spring. The varied species of flora present here is in full bloom, the weather is mild and pleasant and the air is clear, making it ideal for sightseeing, photography and trekking. This season lasts between the months of September to May. In Panchgani, one can go exploring the various ecosystems and the beauty and richness of Mother Nature. Famous points include the Table Land, the top of the Asia Plateau, which is famous as the second longest plateau in Asia, second to the Tibetan Plateau. 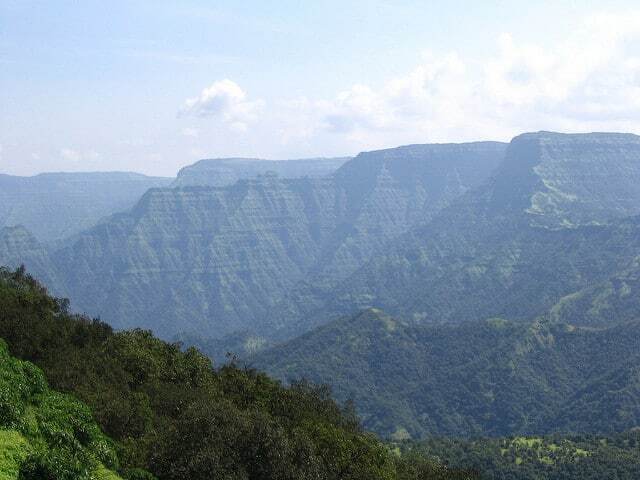 One can see the famous spacious caves of Panchgani from here, such as the Devil’s Kitchen. The Devil’s Kitchen is not only a natural wonder but is also has mythological significance. One can visit the Sydney Point, a mere two kilometers from the bus stand, which is the top of a hillock from which one can see the Krishna Valley, the glittering Dhom Dam, Pāndavgad and Mandhārdeo. One can also see these views from the Parsi Point, which is located en route Mahabaleshwar. Mapro Garden is famous for its strawberry produce and the Strawberry Festival that takes place here each year. Besides this, there is the centre for Mala’s Fruit Products, which were India’s first mass producers of jam. Panchgani is very well connected to the neighboring cities by road. The nearest airport is the Pune Airport, which is a two and a half hour drive from Panchgani. The nearest railway station is, again, the Pune Railway station, 105 kilometres from Panchgani. Pune is well connected by railways and airlines to all major cities of India as well as most nearby locations such as Mumbai, Delhi, Bangalore, Chennai, Kolkata, Indore, Kochi, Mysore, Lucknow, Jaipur etc. Panchgani is best for road transportation, and state transport buses run daily to take visitors to Panchgani. These buses connect Panchgani to cities such as Mumbai, Pune, Satara, Nashik, Phaltan, Bordi, Dhule and Kunkeshwar. Panchgani is best accessed by car or bus. The roads are smooth, though slightly winding. Within the city, one can use cars, public transportation or even simply travel by foot in the pleasant weather. Since Panchgani was always meant to be a tourist destination, there are many hotels and pleasant little lodges and home stays all over the city that one can take up a room in, with excellent views of the surrounding hills.